. for both FF. U can suggest or tell ur views if u feeling it bored. San: how she came in this city aunty? He looked at voice. It was Naina. Karan was also standing with her. They listened their conversation. Naina went to janki. She was crying remembering Ragini’s situation. Naina took her to room and told her to take rest for sometime. Then she came back to karsan. Naina looked at sanskar. Now there was no hate for Ragini in his eyes. Nai: I know ur all questions. I’ll tell everything. Ragini was sitting like dead with Ratan on her lap. Police comes there. Watch man of college heard thier noise and had informed police. They saw Kavya and kavita. Pol: they r still alive. Call ambulance. And this boy’s body take for post mortem. Rag: cryingly shouts this is not body. He’s ratan. They take them to hospital. Ragini also went in ambulance. They reached hospital. Kavya and Kavi taken to OT. Nurse to rag: ma’am pls complete some procedure and take body from hospital. Ragini closed her eyes in pain hearing word body. Even tears dried from her eyes. But still she’s crying. She went near Ratan’s body. She remembers his last words. Rag in pain: Ratan I didn’t knew u loved me. But for me u were always my best friend. I too love you but only as a best friend. Not more than that. But no one can replace u in my life. M missing u Ratan. M missing our friendship. Y did u leave me? Coz of me only u left this world. You gave ur life for me. Sry Ratan. I can’t b a best friend. Someone kept hands on her shoulder from back. She looked back. It was Naina. Ragini saw her and hugged her tightly and cried badly. Naina was also crying. She saw Ratan last only on vedio call. Now he left all. They performed all rituals and comes back to hospital. Doc: good news is that both r alive. But..
Doc: due to sudden shock from her lover Kavya lost her mental balance and Kavita got hit to her head. She went in coma. Ragini sat on chair hearing this. She doesn’t know whether to b happy that her friends r alive or whether to b sad for their conditions. Rag: when will they get full cured? Doc: can’t say. Anytime anything can happen. Nai: both Kavya and kavita r shifted to a special hospital for special treatment as per ragini’s wish. Ragini used to go there daily. And she becomes sad. So we all decided to shift here. After a lot of request Ragini agreed to shift here. But she kept herself busy life. Monthly twice thrice she goes to meet them. After seeing these all her trust on friendship broke. She never spoke with anyone. She became rude. Only u were the first person whom she liked and loved. I only got amazed by her this decision. But after seeing u somewhere I was happy that her decision is rite. Sanskar was lost in thoughts of Ragini. Nai: do u remember sanskar, I had told u once that u don’t know still real Ragini. Sanskar nods. Janki called Naina. Both nairan went from there. San: How much Ragini suffered. Wats her fault in this. She loved her friends, trusted them. Wat she got in return? Betrayal. It’s normal to b rude after this much happenings. He looks at those cd and played one of them. In that Ragini was playing with her friends with full joy. All were kidding enjoying. Sanskar smiles seeing that. Next was ragini’s recorded video. In that she was teasing Kavya and kavita in hostel room. Rag: hello everyone now today’s our friendship anniversary. Each year anyone will buy a gift. That gift will b called as friendship award of that year. This year kavita’s turn to bring gift. Let’s see Wats she bought. Camera moved with Ragini. Kavya, kavita both sitting there. Kavita: I bought. Now u both open. Both started unpacking. It was like same gift which Ragini purchased from that shop. Rag: it’s late lovely. This is for this year. I’ll never let it go anywhere. Ragini showing a handwatch to camera: this is my bday gift from Ratan. It’ll be always in my hand. Sanskar saw full video where he was lost in that beautiful loving, caring Ragini. Just then he heard voice of Ragini. Ragini has returned to home. He came to hall. Nairan and janki also came to hall. 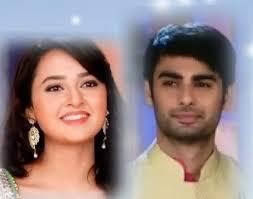 Rag gets happy seeing sanskar. Rag: my baby came here to meet me? In these days I hope u missed me. I missed u too. She side hugged him. First time sanskar felt happy from hearing word baby from her mouth. For him today he’s seeing new Ragini. She may b not so happy like in video but for him she was looking different. Ragini was continuously talking. He was just admiring her without listening her words. Rag: baby. Where u lost? See here wat all I bought for u and laksh. Coz of ur office work we cudnt see each other. U dint receive my video call also. Sanskar dint answer anything. He only wanted her to seeing talking like this always. Rag: cheeku, Karan. I was thinking to go for a picnic with both families. Swara will join us. All surprised hearing sanskar. All get happy. They went to home discussing abt picnic place. Night sanskar was thinking abt Ragini only. Kar: I think someone is in deep love. San in mind: may b Karan is rite. I’ve started to love u Ragini. Coz till now I saw fake Ragini. Today I knew and saw real Ragini. My heart want to give u happiness. My heart want to see u like before. I can do anything to see u like before. He too slept thinking of Ragini. Next day all went to picnic. Suj: he’s always busy. Now he shifted to other city. Rarely he comes to meet us. Rag: it’s ok aunty. Mom and dad also in next car. They’ll reach within few mins. They sat in a garden on mat. Elders started to unpack the snacks properly to eat. Swa: hey lets play hide and seek. San: we will tie cloth to one person eyes, that person has to find us. All agreed. First turn was laksh. All were calling him and moving but he cudnt catch anyone. He gave up. Like this only they keep on playing. Now Ragini’s turn. Naina ties cloth. She started to find, but she too like laksh cudnt catch. Ragini comes almost near to sanskar, but he didn’t make noise so she was abt to go in other direction. Karan pushed sanskar and he fell on Ragini. Rag: hey I caught someone. She removed cloth and saw sanskar on her top. They share an eyelock. First time they were very close with love for eachother. Few seconds happened they were still lost. After few seconds they heard whistle sound and came to sense. They saw all r sitting around them including shejan and sujata. And they’re also looking at them. Kar: laksh, y did u disturb? Sanskar, u continue, we r here and we r enjoying. Ragini blushes and sanskar ran behind Karan to catch him. All started to laugh. Naina comes to Ragini and hugged her with moist eyes. Rag: hey cheeku. Wat happened? Nai: nothing. Simply. M happy for u. Both hug each other. Shejan also get happy.